I joined two Bethlehem colleagues at 3:45 a.m. to walk to Check Point 300, the entrance on the Bethlehem side of the Separation Barrier for Palestinians with work permits to enter Israel. And this is what I saw when we arrived – people streaming towards the “cage” that channels you up to the first turnstyle to enter the Check Point. We walked in the Exit lane with our cameras safely stowed out of sight. A soldier sitting in protected room presses a button to open the turnstyle, then focuses on his mobile device for a game of Bejeweled. When his walkie-talkie squawks, he presses the close button and the line stops. EAs use a counter to record the number of men, women, girls and boys passing through the first turnstyle. After recording for 30 minutes, we switch off with another EA and two of us enter the cage to go all the way through. 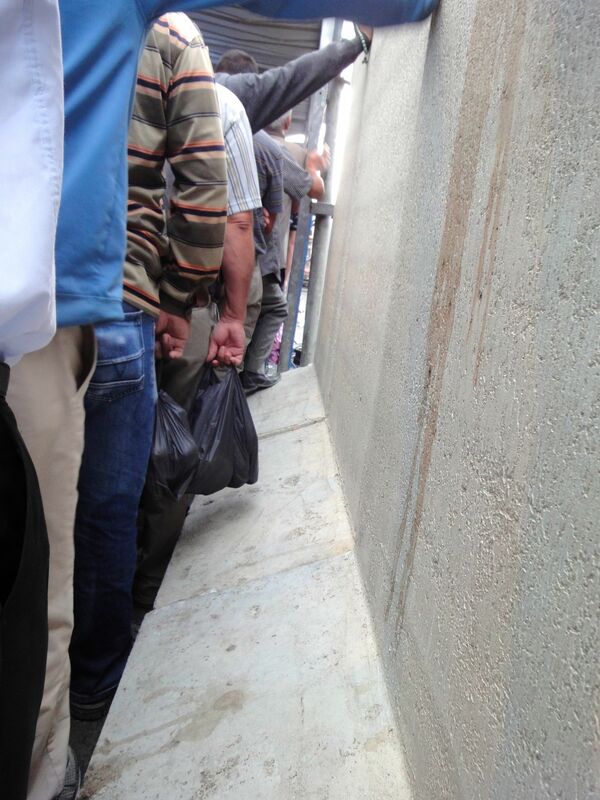 Here we saw men with their arms through the bars, the cage completely filled. These Palestinian workers are among the lucky. They have a work permit that allows them to earn money in Israel. Some – only 50 shekels ($14) a day. No benefits. No health insurance. No pensions. Just money to help keep their families going. You may have observed that almost all of these Palestinians are over the age of 30. 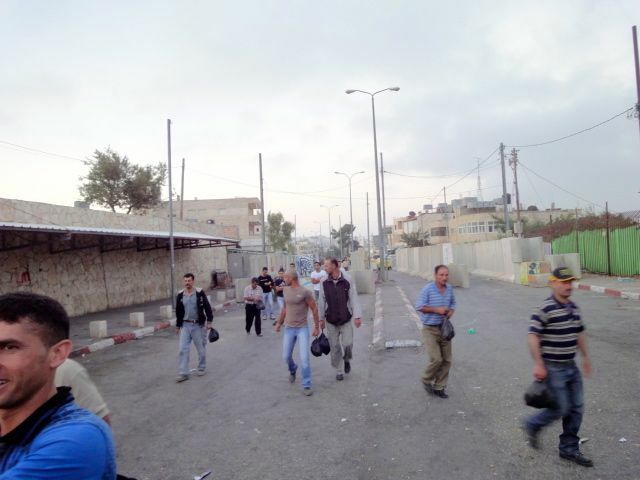 Younger Palestinians are considered a security risk and do not get work permits. Nearly 75 % of the youth and young adults in Palestine are unemployed. It took us over 60 minutes to pass through the first turnstyle, walk into the security building, put all of our items in a tray, including our belts, hold up our pants as we walked through the scanner, retrieve our belongings and line up for the ID check. At the ID check, Palestinians put their wallets on a scanner, hold their work permit up for the officer to see, and place their index finger on the fingerprint reader. The officer verifies the permit number with the photo and information that comes up on the computer monitor. If everything matches, the worker is cleared and runs to catch a bus to his or her workplace. If not, the worker is turned back. For internationals like us, we merely hold our passport up to the glass and the officer waves us through. The EAs then stand at the exit and wish the workers passing by a “good morning,” “good to see you,” “have a good day” in Arabic and English. Some stop to thank us for helping them. The whole point of this exercise is to monitor the efficiency of the check point and try to keep things running smoothly so workers are not further delayed getting to work. In western countries we are also subjected to scrutiny when traveling from one country to another. However, we have options for frequent travelers with access cards to get through security quickly. 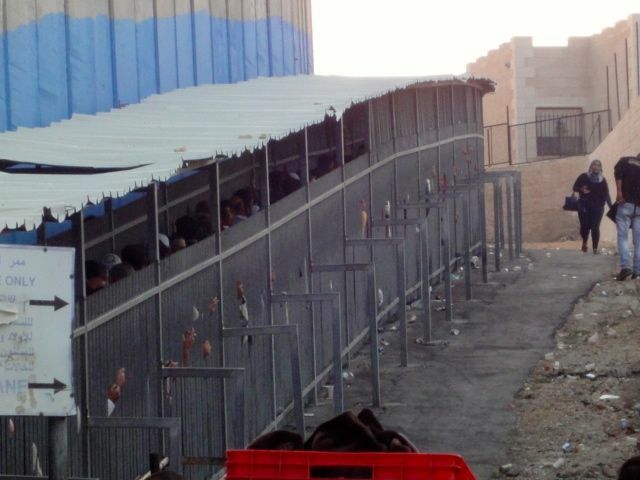 And we are not put through wire cages in such a dehumanizing manner. 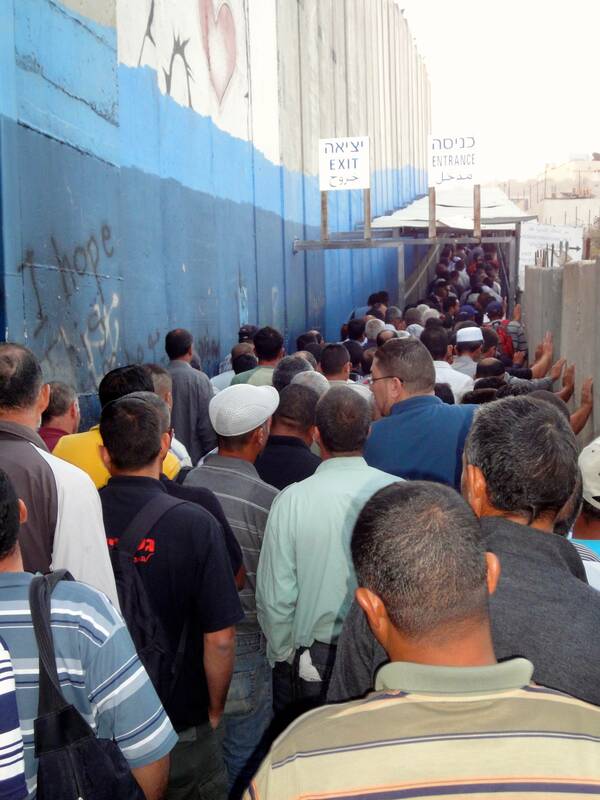 This is a daily nuisance and an intrusion into the lives of those Palestinians crossing into Israel. Many others cannot for “security” reasons. They are locked into the West Bank and many cannot worship at the Dome of the Rock in Jerusalem, visit relatives living in Israel, vacation on the Mediterranean Sea, or travel to other countries through the airport in Tel Aviv. Sad, frustrating, undignified and tiring. This entry was posted in Palestinian Families, Separation Barrier and tagged Bethlehem, Check Point, Israel, Palestine, Palestinian people, Separation Barrier, work permits. Bookmark the permalink. I applaud your desire to help the oppressed and horribly mistreated palestinians (dripping sarcasm). Maybe you should protest at any US or European airport, where millions of travelers are barbarically forced to undergo similarly humiliating security checks every day. Your last line betrays your ignorance and naivity in regards to the Middle East conflict. The Dome of the Rock is not the holiest site in Islam. You must have meant Al Aqsa mosque on the Temple Mount, which is the third holiest – after Mecca and Medina. Or maybe you meant the Temple Mount is the holiest site for judiasm? If so you should have mentioned that Jews are forbidden to pray at this holiest of sites (by the Islamic Waqf). I sense a hypocritical double standard that can only come from a well meaning but niave European. Thank you for your comment. I have corrected the reference to the holy site – my error. My posts are not about the conflicts in the Middle East, a subject far too complex for me to make sense of. I am merely trying to understand why a state in violation of international law continues to treat the residents of an occupied territory as terrorists. Sadly, in this world, a very small number of people have taken actions that are abhorrent to civilized people. And we all pay the price with increased security measures. Defending one’s borders and maintaining internal security does not excuse a state from using degrading, fear-inciting and violent tactics on a population that the occupying state is responsible for protecting. It’s good to know that freedom of speech is still alive in some parts of the world. Thanks again for commenting. Thank you for taking the time to read my blog and comment. I did experience Checkpoint 300 on three occasions on foot and during an EAPPI monitoring of the that place just before Ramadan. As a member of the monitoring team, it took me over 60 minutes to pass through the cage, through the scanners, through the ID check and out the other side to meet with Machom Watch. As an international, I was subjected to fewer indignities than the Palestinians going to their military-issued work permitted jobs in Israel. 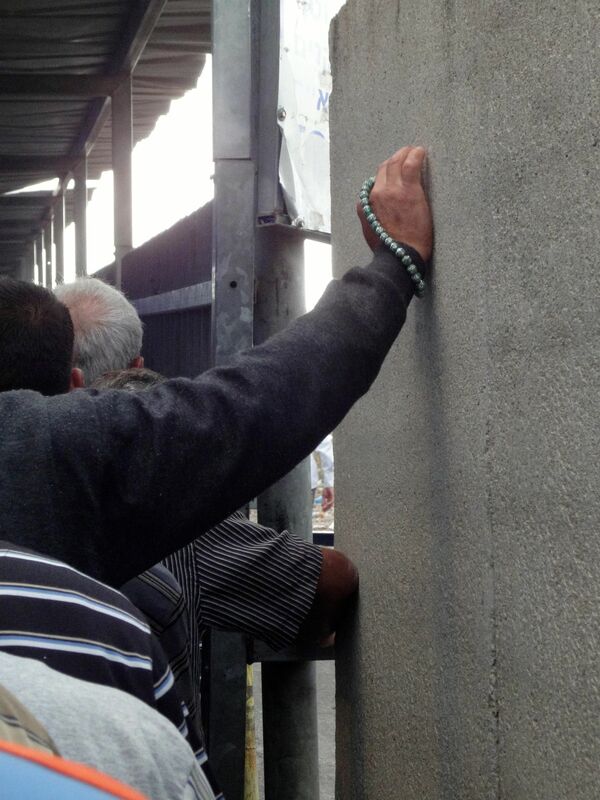 I also traveled through Qalandia on many occasions during my three month assignment in the West Bank. I agree with you that the treatment of Palestinians is humiliating and disgusting, and illegal. Living with Palestinians for three months in a small, traditional village surrounded on three side by illegal settlements and outposts and a military camp. Three months is the maximum time allowed by Israel. 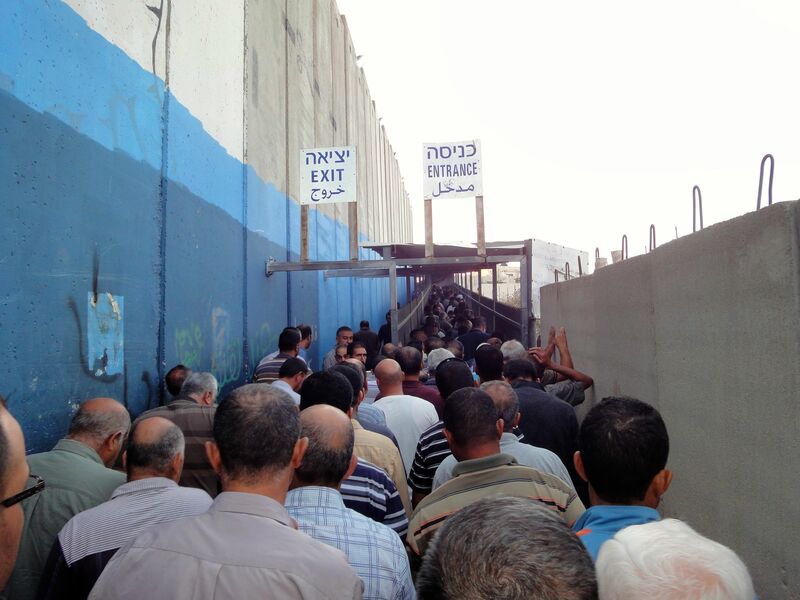 I learned first hand what Palestinians face on a daily basis. And I, too, was harassed by ideological settlers and the Israeli Defense Force. I learned that Palestinians are not terrorists. They are warm, compassionate, caring and generous. And they are firm in their resolve to stay on their lands, tend their flocks, harvest their olives and raise their children in dignity. 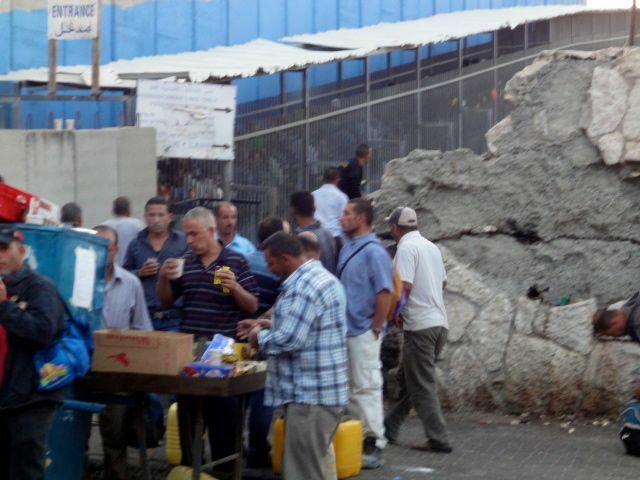 They offer tea, coffee and meals, even when their homes are demolished by the Israeli Defense Force. And during my brief ventures into Israel, I met with a number of Christians, Muslims and Jews. I worshiped with Orthodox Jews in Jerusalem and heard their stores. And I worshiped with Christians in Nablus and Ramallah every Sunday, and was invited to a mosque in Haifa. An international sent by the World Council of Churches as an Ecumenical Accompanier, I was not a tourist. I was charged with providing protective presence for Palestinians living in this illegal occupation, reporting on abuses of human rights, challenging the Israeli Defense Force members, and listening to Palestinians who wanted their stories told back in my country. And I am doing just that every week. I want the occupation to end. Full stop. An end to the occupation. Can we agree on this? And thanks again for challenging me. Here is an article from the Ottawa Citizen today. Thought you might be interested. Hi Margo, Thanks for bringing this article to our attention. Not only are the Bedouins in Israel proper in the Negev region facing evictions, but the state is systematically demolishing Bedouin houses in the Jordan Valley in Palestine without any plan on where they might relocate. Ten homes in three communities on June 27, with three families who rebuilt having their homes demolished yet again on July 9. Israel appears intent on annexing a large part of the West Bank, along with pushing herders out of the Negev, all at an accelerated pace. I’ve also read about the Prawer-Begin plan that forces 30.000-40.000 bedoeins to move to a city. It’s a shame.